Wine stains – we’ve all been there. A glass of wine carelessly knocked over in the middle of an animated conversation, an open bottle getting in the way of an elbow and over it goes…. contents are spilled onto tablecloths, sofa fabrics or fitted carpets. Disaster? Red wine stains in particular can be hard to shift. As with most things, speed is of the essence to contain any damage. 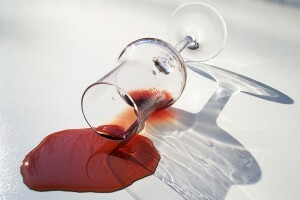 There are many ways to tackle wine stains quickly – table salt, baking soda and hydrogen peroxide have all been shown to be beneficial for stain removal. We recommend that you follow these top tips in the first instance, then contact a professional cleaning company for advice and to remove any leftover stains. Blot up as much of the spilled liquid as you can as quickly as you can. Don’t rub from side to side, but blot in an up and down motion to minimise the damage. Work from the outside in to prevent the stain from spreading. For upholstery, mix a tablespoon of dishwashing liquid with a pint of cool water and sponge the stain with a clean white cloth, then blot until dry. Repeat the process until the stain has gone, then sponge with cold water and blot dry. For carpets, mix a tablespoon of dishwashing liquid into a pint of warm water and add a tablespoon of white vinegar. Apply a little at a time with a clean sponge, and blot frequently so that the area doesn’t get too wet. Repeat until the stain is gone, then sponge with cold water and blot dry. It’s important to consider the material you are treating so as not to cause more damage. Check the manufacturer’s instructions for advice and make sure you consult a carpet cleaning or upholstery cleaning professional – it’ll be worth it in the long run.